Our company's mission is simple: We serve to help you take care of yourself and the ones you love the most. We are a small, family owned company ready to serve you better than the biggest companies. So... welcome to the TCC family! We know you will absolutely love our Video Baby Monitors which is why we offer a 100% money-back guarantee up to 1 year! Your purchase is RISK FREE!! Don't wait! These prices are here for a LIMITED TIME ONLY. Click the "Add to Cart" button above. SHARE THE PERFECT GIFT! 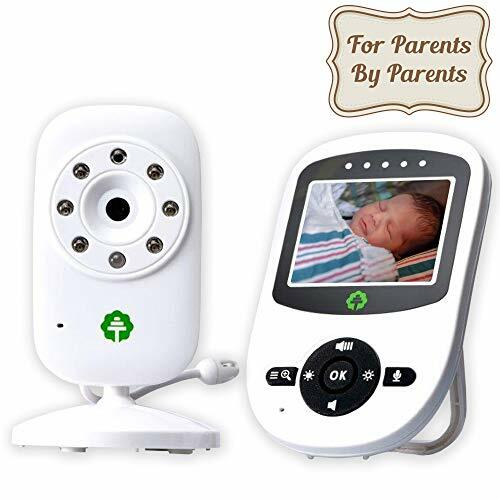 Order our Video Baby Monitor for you AND your loved ones and get FREE SHIPPING! Battery Watt Hour Measurement: 3.5 WH. WE GET IT BECAUSE WE LIVE IT. Unlike other companies, we use our monitors daily because we are parents and we know parenting is hard. Let us help you make it a little easier. Our wireless 2.4-inch, High Quality Digital & Color, LCD display with Auto-Infrared Night Vision and Two-Way Talk Back feature allow the control to always be in your hands... Until your kids lose the monitor. READY TO GET MORE SLEEP? It's no secret... sleep time for our precious kiddos can mean scream time. Providing the best environment for sleep is essential. Our monitors can play Soothing Lullabies and Monitor Temperature to set the scene for ideal sleeping conditions. MAKE TODAY PRODUCTIVE! You are free to roam and conquer that to-do list during nap time! Our monitors stay connected up to 900 feet (in open space), preserve battery life up to 12 hours with ECO Mode Voice Activation, and even connect to multiple cameras seamlessly. WHAT ARE YOUR KIDS UP TO? Strategically place your camera and you will never ask this question again. Our cameras provide Digital Zoom, 360-degree Manual Pan, Tabletop and Wall Mounting Options. RISK FREE PURCHASE. These monitors are built to be 100% reliable. Therefore, we offer a 100% money-back guarantee for an entire year from purchase date. We are here to serve you in any way that we can. If you have any questions about this product by Total Connection Company, contact us by completing and submitting the form below. If you are looking for a specif part number, please include it with your message.